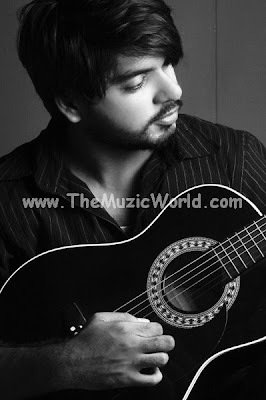 MADI is back with his new song TERE JANE KE BAAD.....His last single ' HUN BOL' was hit track. His latest track is recorded and produced by SAM of AKASH THE BAND and most of the other credits are going to MADI himself. To download the song TERE JANE KE BAAD by MADI, 'RIGHT CLICK' and 'SAVE TARGET AS' on the given link below. To listen the song, click on the blue 'PLAY' button. 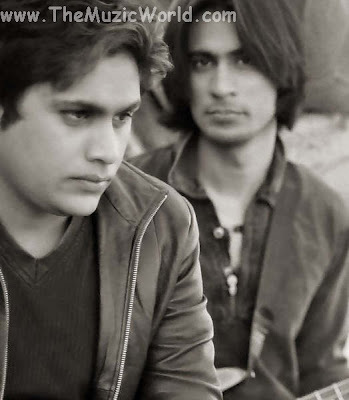 There is a new band fro Lahore, PAVAN THE BAND. 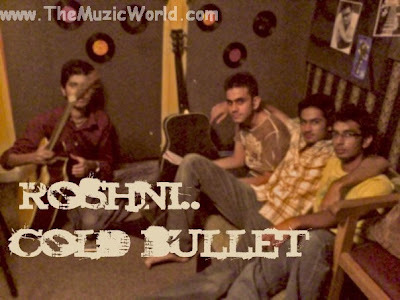 There are 4 members in the band and they are out with their debut track DIL NE TUJHE. This is a nice track and recording could be much better... Well, these guys are very young and their first song is very promising. To download the song DIL NE TUJHE by THE BAND PAVAN, 'RIGHT CLICK' and 'SAVE TARGET AS' on the given link below. To listen the track, clicK on the blue PLAY BUTTON. 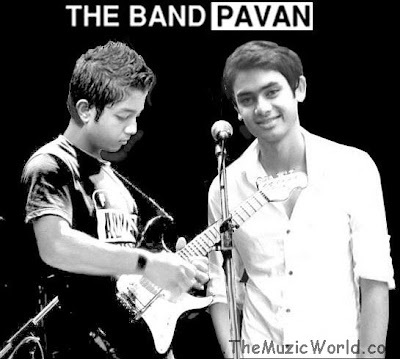 Download DIL NE TUJHE : THE BAND PAVAN. To download the video of MORAY PIYA of JAL THE BAND, 'RIGHT CLICK' and 'SAVE TARGET AS' on the given link below. There is one more concert in KINNARD COLLEGE on 30th November from SURKUL RPODUCTION. 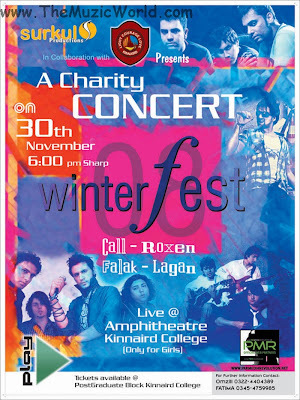 In this concert, CALL THE BAND, ROXEN THE BAND, FALAK AND LAGAN THE BAND will perform live...... Details of concert is given in the picture above. So do not miss the chance to get all ypour favorite bands, live in action. 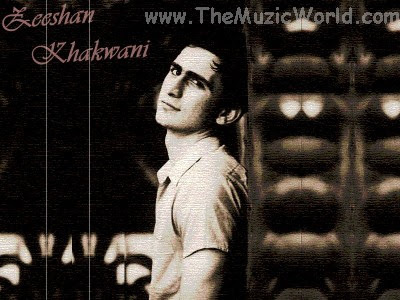 Just few days back, i made the post about the debut album, MAULA of KHAWAR JAWAD and there is a song from that album, KAHAN HOON MAIN. Now this song is available in the voice of FAIZA. 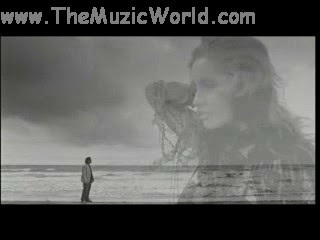 FAIZA gave vocals in the song BANDEYA with KHAWAR JAWAD from the movie KHUDA KE VASTE.........FAIZA's version of KAHAN HOON MAIN is much better thanthat of KHAWAR's and it is a rock ballad. To download the song KAHAN HOON MAIN by FAIZA , 'RIGHT CLICK' and 'SAVE TARGET AS' on the given link. To listen the song, 'CLICK' on the blue 'PLAY' button. In the last week of november, there will be some big concerts with few big names of Pkaistani music industry. 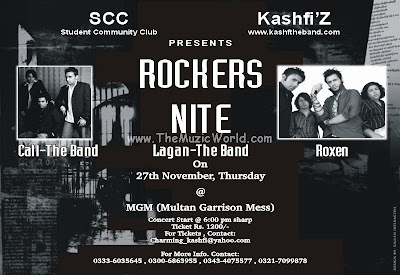 On this 27th November, CALL THE BAND, ROXEN THE BAND and many other bands are going to perform in ROCKER'S NITE. You can find the detaisl from the above picture. 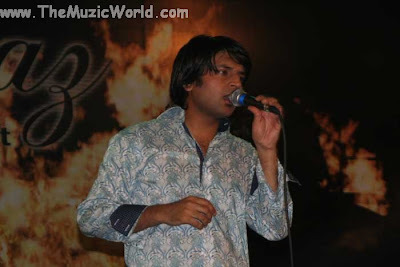 KHAWAR JAWAD , vocalist of the hit single BANDEYA from the movie KHUDA KE VASTE, is back with his debut album MAULA. This album is also including his hit single, BANDEYA in many different versions. To download the song, 'RIGHT CLICK' and 'SAVE TARGET AS' on the given links. To listen the tracks, click on the blue 'PLAY' button. So here comes the new rapper from Pakistani underground music, BABAR KHAN aka b-X with his debut track RESIDENT EVIL.b-X is inspired by Eminem when it comes to singing and the lyrics are inspired from the themes of IRON MAIDEN.... The song is about war time and a man who is concerned about the situation, who understands the complications, the politics and the propaganda and is fighting besides many other soldiers and is willing to fulfill his duty to his country. To download the track, 'RIGHT CLICK' and 'SAVE TARGET AS' on the given link below. To listen the track, click on the blue 'PLAY' button. This is an entertainment and music blog. And i started this blog to promote the underground talents and i think, this blog is doing good. As you can see that most of my blog posts and artists belongs to Pakistani music industry and sometimes i am also making posts about Indian music industry. But i got many requests to add contents of other artists as well. So now , i will make posts on western bands and rock music too and still the motto of The Muzic World will be to promote the underground talents. And i am going to start this from now. Today i am going to share about the Naked Brothers Band. Naked Brothers Band is about two person, Nat and Alex Wolff. They just finished the video shoot of the Naked Brothers Band and currently on tour and performing in concerts. You can download their latest track ' I Do Not Want To Go School ', from their official website. On this saturday, Nat and Alex Wolff will be availale for live chat about Operation Mojo. In the latest episode, Nat has lost his mojo and the Naked Brothers Band heads to woods for some dudification. You can get more information about this band from their official website. To download the song SHER DIL , 'RIGHT CLICK' and 'SAVE TARGET AS ' on the given link below. 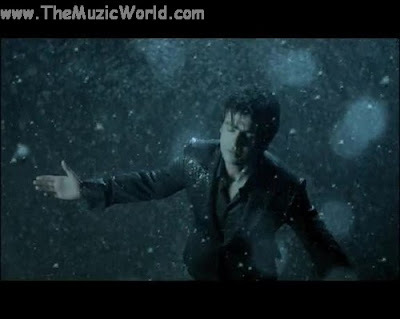 After the success of the video LAGA RAH, Shehzad Roy is going to back again with his latest video EK BAAR. It is a nice love song, so hope that video will also be a nice one........ I got the pictures of the video shoot of the song EK BAAR by SHEHZAD ROY and i am sharing that with you all. 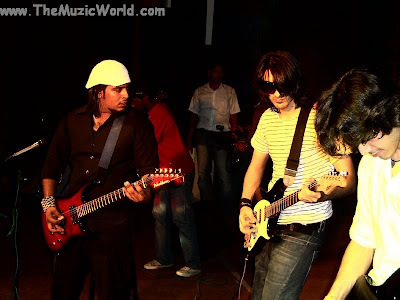 JAL THE BAND is now working for some good cause and recently they joined the PETA and Farhan Saeed recently sang the praises of animals in an exclusive petaDishoom (Indian unit for PETA) interview. When asked why he thinks it is important to speak up for animals in distress, the kind-hearted rocker said, "Animals can't speak up for themselves. Human beings ... can and should help animals. If you have pets in your house, treat them like family. If you have taken up the responsibility of keeping them, live up to that expectation". Seems like now they are having more reasons to be in the news. One of the biggest and the pioneer of the rock music scene in Pakistan, NOORI is going to come back with a bang now with their latest video DI DIL and this video is available EXCLUSIVELY on THE MUZIC WORLD now.....Soon they are planning to release their third album....So croos your fingers for the biggest rock act of Pakistan, NOORI. noori's latest music video: Do Dil from noori on Vimeo. 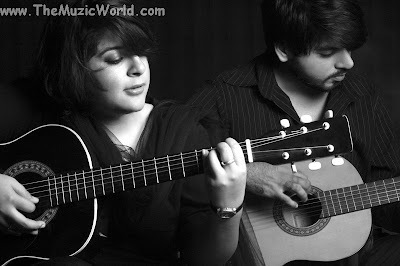 About Video : After a hiatus of almost 2 years NOORI springs back with their latest offering 'Do Dil'. It is the first song ever composed by the band. In fact it is this song after which the brothers decided to start the band. The video is directed by Mandana Zaidi. It begins with the actual footage from 1996, of the first attempt to record the song. The video has clips of some of those that have been a part of the NOORI journey in one way or the other. This song exactly the way it was 13 years ago. Of course the engineering and the production has been redone thanks to Mr. Shiraz Uppal. JAL THE BAND is going to come back with their latest video MORAY PIYA from the album BOONDH. Teaser od that video is available and it is looking really good. Hope that soon the whole will be available for all JAL THE BAND fans. Watch the video teaser of the song MORAY PIYA by JAL THE BAND . 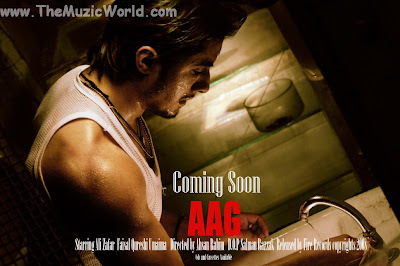 ALI ZAFAR is back again with his new video AAG.... Few days back , i posted the VIDEO TEASER OF AAG and also some of the wallpapers of the video AAG. And now the full version of that video is available and you can watch and download that from here. 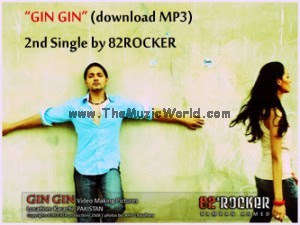 After the great success of JUDAI, 82ROCKER is back with his latest track GIN GIN and it is getting popularity as people were waiting for this track. 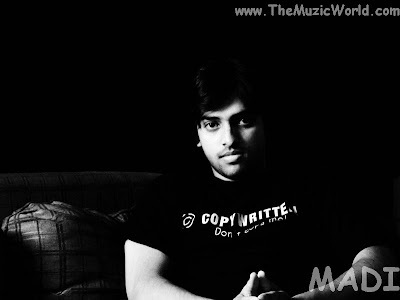 Mak Mansoor & Maiez Arif directed the video of GIN GIN. 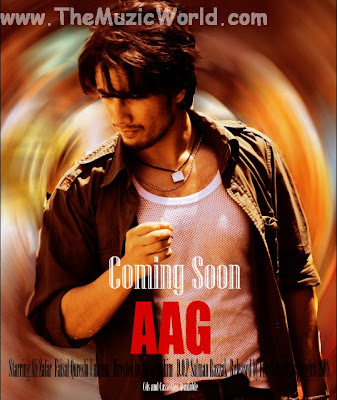 So finally AMANAT ALI is back in the music scene and this time he got the chance to sing in the movie DOSTANA. This song Khabar Nahi is a duet song with Shreya Ghoshal. 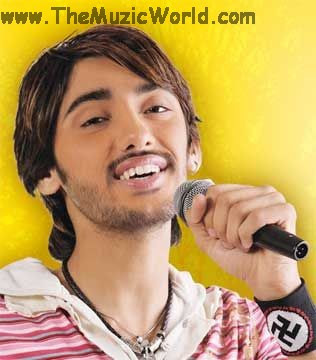 Hope that soon he will get the good position among the Pakistani singers. To download the song Khabar Nahi, 'RIGHT CLICK' and 'SAVE TARGET AS' on the given link below. To listen the track, click on the 'PLAY' button. One of the biggest band IRTAASH from Pakistani underground music scene is back again with their latest track. This track is the unplugged version of their old track MUSAFIR and it is really nice to listen this soft version. To download the track MUSAFIR by IRTAASH, 'RIGHT CLICK' and 'SAVE TARGET AS' on the given link below. To listen the track, click on the 'PLAY' button. 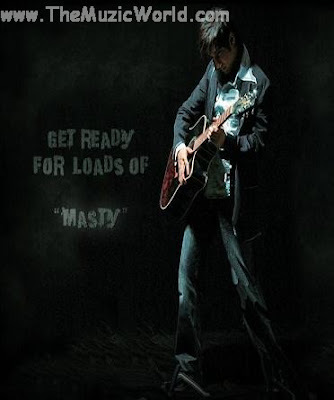 AKASH is going to come back with lots of music videos. Few days back, they released the video of the song KYON and now the time is for ROCK FUNDA and NA MIL SAKA....I got some stills from these music videos and i will share them with you all very soon. 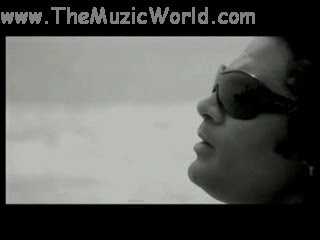 But for now i am going to post the video of the song KYON by AKASH THE BAND. Doing MBA , currently working for a news paper. We used to study in same faculty and usually meet and discussing music and all. having spent lots of times together we decided to firm a band because similarity we have same taste of music. Our music genre is rock alternative-rock and kinda serious rock and we chose to name the band “SKETCHES” Because whatever we plan first we make its sketch in our mind and name suits to our music too. The band was firmed in 2004 and we worked on the melodies and lyrics seriously to develop a progressive sense in our music we always tried to focus inner feelings of human and what are we. The social issues and various issues of the system. We want to bring changes in the world with help of our music and thats what SKETCHES means to us. “We believe to be the change that you want to see in the world”. 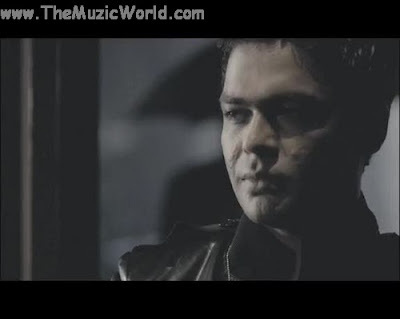 Few days back i made post to download latest video KHAIREYAN DE NAAL of SHAFQAT AMANAT ALI and this time i am posting some stills from the very same video KHAREYAN DE NAAL.....Hope that you will like them. Hey Musti Bhaai, it’s nice chatting with you after long span of 3.5 years. This is my first time too that I am writing on any forum for my self. I believe there are some misunderstandings or you forget past time when we worked together that you are blaming such riotous things to me. Now let’s keep the truth out to the world. I’m in music far before than you, you must have remember the time when Xulfi Bhai asked you for the songs (for album recording) and you had nothing in your hand except few lines of “Yaadein”!!!!! Then how you plead me for making songs for your album ……. Just forget it I made songs for Roxen and never claimed for that. I was 15 yrs old when I started working for you and was kid in front of you at that time that’s why you made me fool, ooopppppsss sorry……… I still respect you as my elder brother and always have good intentions for you and your band. 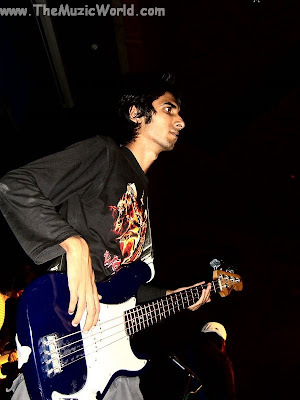 1) Musti Bhai you know music is my passion and I m in music since I was just 12. I have not even helped you in your songs rather composed 5 songs of your album. I never wanted to mention but I guess you want me to disclose now. Songs were, if you forget a)Sapnay b)Chalte Rahey c)Aaj d)To phir aao e) Jag chor diya. 2) Please Musti Bhai why should I come to you people and asked about my own composition. First, I have never appeared in your jam sessions. Secondly, how come a professional band still don’t know not to play sessions in front of another composer please Musti bhai jane dein !!!!! Thanks for wishing me good luck, let me clear you one thing MashAllah I am an ACCA student and my social circle belongs to respectable and educated friends who respect elders……hmmmm you might are receiving abusive mails from your upset fans who do not believe that Roxen can STEAL any artist’s song. Getting attention was never my motive and the way u mentioned ahan I could have got it this way when you have launched your first album. 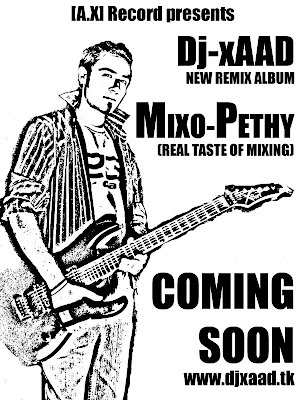 As you know that music is my hobby and I just got my song recorded for my friends which I have composed back in 2003. Hey for your information I have performed this song at SKANS Annual function on 26 March 2008 while as you said your show went on air in April 2008, which i have never watched. But after hearing your teaser I really got disappointed that Roxen the big band have stolen my song. Just think how much your fan following got disappointed. 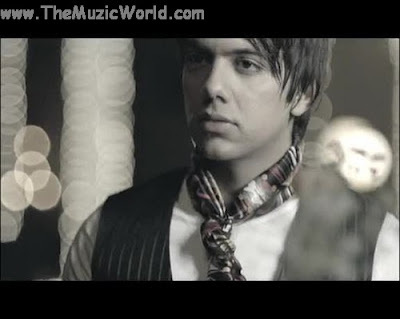 Hey talking about Hudh you said you can come up and claim it since Haider is in your band please mere bhai go for it, Since you are a Top band in Pakistan these days you can claim any Artist’s song like mine………but from inside, you know all the reality and believe me you can never hide the truth….. 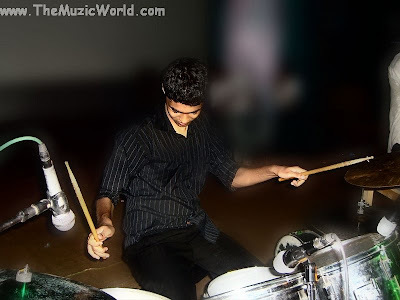 However in your post I got to know one new thing that Haider’s mom can also compose the songs  which I never got to know in 7-8 years I have spent with Haider. As you said your respect is prior than fame so as a member of a Top band this doesn’t suits you to steal any other band/artist song even if other band broke up and other band member is now part of your band. People wants to listen Roxen , Roxen’s compositions not any other band’s/artist’s compositions. 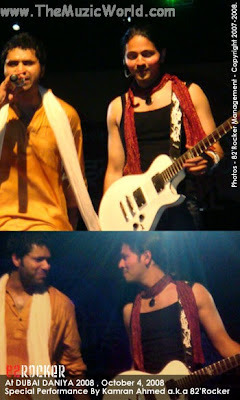 Few days back, i made the post about the video SAJNA of WE THE BAND. And now i got a video of their live performance at Kinnard College For Women, Lahore. Here you can watch the video of that performance and keep visiting for more updates about WE THE BAND. Well i am giving the download link of the video KHAIREYAN DE NAAL and you can also watch the video directly here. 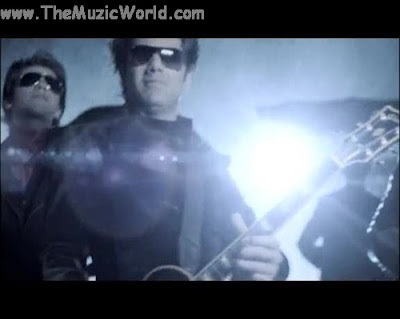 Here is a new band from Pakistani music scene. EHSAAS THE BAND is out with their debut track CHALO and they are having 5 more songs under their belt. 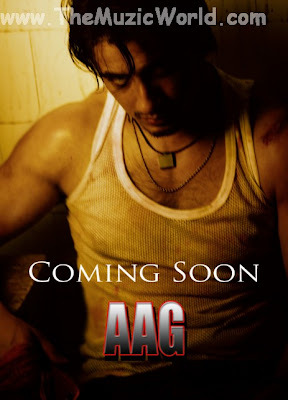 Seems like soon they will release few more tracks....Till then , enjoy CHALO. To download the track, 'RIGHT CLIKC' and 'SAVE TARGET AS' on the given link below. To listen the track, click on the blue colored 'PLAY' button. in our album.i still dont regret it.Thanks for always helping Us. I wish you best of luck with your future despite the fact that i recieve hatred emails from ur friends everyday and even abusive emails of which i can react strongly then anybody else but No it doesnt suit me. If you wanted this song you could ve come up to us and ask us once that you want this song for ur album and i swear i would have never said no to you but what you have done right at the time of our album release is sad.We all love attention i am sure you are loving it too these days but for me fame and gettin attention is not much than my respect and you will realise this couple of months from now what damage you are doing to yourself. I dont know how my band would react to this post as i have not taken anyone in confidence but yes i dont regret a single second of working with you and still consider you a part of Roxen family because i am a man of my words. dont have a habbit of going out to the world crying infront of them asking them to help me.I have my music to help me through my fans and it will the day my fans are going to hear Bujh Hai Gaya from Roxen. the show right away in seconds then you think we would go out and copy someone else tunes? Can i just laugh ? ..
p.s i ll be thankful if our fans stop dissin omar on our forums.Lets just not degrade anyone please! OMER NADEEM also replied about this in the very same forum... I'll share that in my next post. 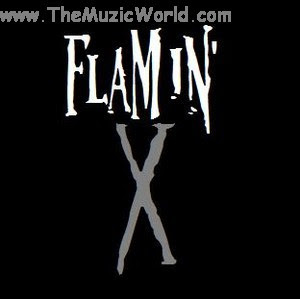 So here a is new rock band FLAMIN' AXE is in a making. The band profile is like this that Flamin' aXe came into existance when Absar left his former band Ikhtira and colaborated with Raptor of Skehlaaj, and Raptor's close friend Hesab was also asked to join along too. Their genre revolves around Metal and Rock. This band was created on 8.08.08. On their 1st day as a band they made a demo of their upcoming song Hide Their Faces. You can also join their official FLAMIN' AXE Orkut Community. I am home and since last 3 days , i am suffering from fever. It is a viral fever and it will take time to be over. Well i was searching to get some information related to this and came to know about Epocrates. It is online medical service where you can find all the information related to any disease or health problem. They are having some web based application and have a huge data base for all type of disease. Like if you want to know about the disease Cholecystitis or any other thing then, you can find the information here at Epocrates. They are also having an integrated drug reference guide...... I also got some information related to viral fever an hope that soon , i will get over from it. 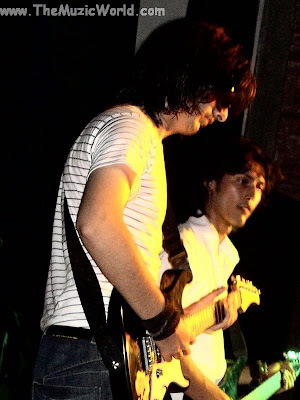 As i made the post about ALAG THE BAND's performance at ROCK FIESTA 2008, now i am sharing the video of their performance. In this video, they are performing their hit debut track SABSE ALAG. You can see that their fans are going crazy with their energetic performance of ALAG THE BAND.....Hope that more videos of their performance will be available soon. JAL THE BAND performed at OSLO, NORWAY. and that tour was a big hit. In the video that i am posting here, you can see how people going crazy when JAL THE BAND is performing their hit track AADAT. More than 22000 people attended that concert. Few days before ALAG THE BAND performed at ROCK FIESTA 2008 and it was really a nice performance. 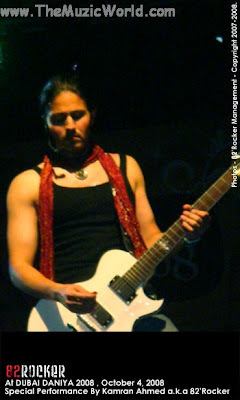 I got few pictures of that performance from the band members and now i am putting those all for you here.... 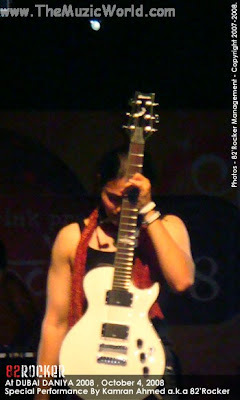 Soon i will share the video of the performance of ALAG THE BAND at ROCK FIESTA 2008.